30 April 1900, northeast of Bloemfontein, the morning had broken clear and sunny. For the Australians of Colonel Tom Price's force operating on the high veldt from their base at De Lisle Kop, the day could have been any day in the Australian bush – hot days and cold nights all with clear air. For days General Tucker's force had been seeking the Boers without success. Approximately 300 hundred Australians, mainly from the Victorian Mounted Rifles, were on a reconnaissance in force in the vicinity of Hout Nek. At the rear of the column rode a troop of the South Australian Mounted Rifles under the command of Regimental Sergeant Major William de Passey providing the support for the VMR operation. As they approached Karee Kloof about five kilometres from their start point, Colonel Price dropped the South Australians off to form a firm base some 500 metres from the ridge whilst his soldiers tackled the ridge itself. De Passey carefully hid his force in the folds in the ground in enfilade to Karee Kloof and waited. Not a sound disturbed the veldt and the Victorians soon disappeared over the hill. Then all hell seemed to break loose beyond the crest of the hill. Artillery, pom poms and rifle fire mingled with blown whistles and the screams of horses. Soon the Victorians were falling back, many riding double. Colonel Price galloped by calling out to De Passey 'Hold them if you can until I get my men together at the next set of hills' down the hill in full pursuit. De Passey waited, then at 400 metres gave the order for 'rapid fire'. 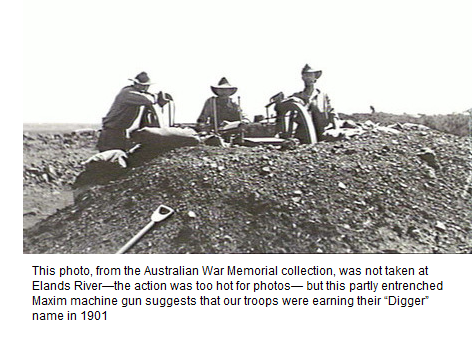 Immediately the South Australian Colt 'potato digger' machine gun opened up, followed by the riflemen. The Boer advance came to an abrupt halt as they sought what cover they could or made their way back to the crest of the hill to take up fire positions. De Passey mounted his force and made off under fire from the Victorians on the next ridge. So ended one of the few recorded successful machine gun engagements by Australians in the war. De Passey was promoted to lieutenant, whilst Sergeant Leonard Knapman (the machine gun sergeant of the SAMR) received the DCM for the operation. 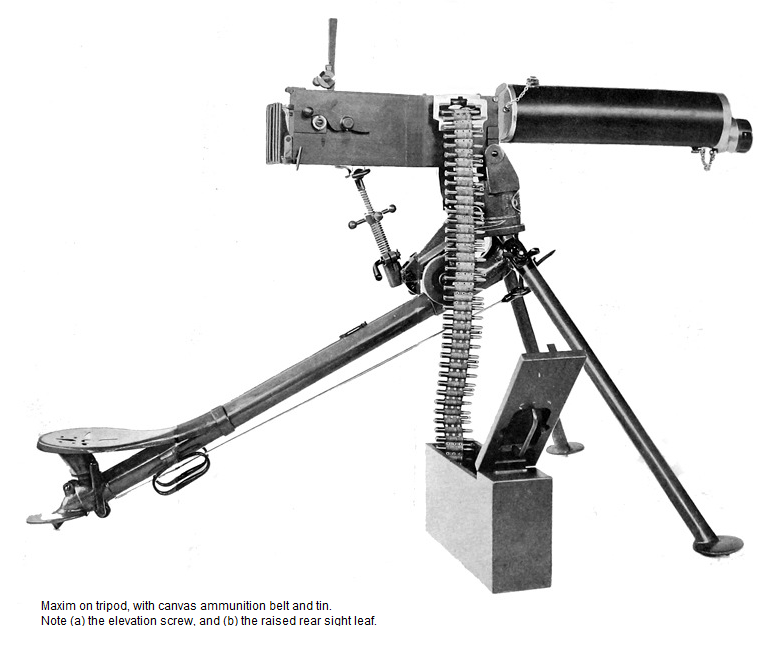 The automatic machine gun had been invented in 1885 by an American Hiram Maxim. It was the British army which first adopted it into colonial service by 1889 and regular service by 1891. The stopping of a charge of 5000 Matabele warriors by 50 British soldiers and four Maxim guns had become the stuff of legend so that by 1896 the British army had adopted the Maxim on the scale of two per brigade. Now however the Maxim had been converted to fire .303 smokeless powder rounds rather than .450/577 black powder rounds of earlier versions. They still retained the artillery style carriage for mobility. In fact throughout the Boer War the Royal Artillery retained responsibility for the issue, maintenance and training for all machine guns and gunners in South Africa. Many in the army still regarded them as light artillery weapons even though they could be dismounted from their carriages in defensive locations. Both versions saw service in the Boer War. The Maxim was a water cooled weapon with a rate of fire of 600 rounds per minute; the gun itself weighing in at 32 kilos without its water coolant. Other designers began to develop their own versions of the automatic machine gun. Chief of these was John M Browning who had developed the Colt 95 machine gun, better known by its nickname the 'potato digger'. It had the three advantages of being air cooled, a rate of fire of 380 rounds per minute and was considerably lighter than its Maxim counterpart. The 1st (QMI) Contingent to the Boer War took with it the machine gun section of 'A' Field Battery, the Queensland Permanent Artillery. This section was formed as a permanent unit in 1897. This was one of the few subunits drawn from existing colonial units sent to the Boer War. The section was armed with two .303 Maxim machine guns mounted on field gun carriages. The concept was that each carriage could be pulled by a single horse. Two of the gunners had seats on the carriage on top of heavy ammunition and stores boxes suspended over the axle as per standard British practice. The horse between the shafts was led by a rider on his own horse whilst the remaining members of the section would be mounted on their horses. This concept worked well supporting infantry manoeuvres on England's Salisbury Plain given the short distances and benign countryside. In South Africa the thinking was soon revealed as flawed. Not only were the distances extreme and the country and climate rough but fast-moving mounted columns often left their artillery and support vehicles floundering in their wake. What was worse was that the general condition of horses was appalling. Instead of one horse four often had to be used and still could not keep up. The section consisted of Lieutenant Cecil H Black, Sergeant Frederick Price, a corporal, and two bombardiers, eight gunners and four drivers. In South Africa a Queensland Special Service Officer Major V C M Sellheim was attached to 1 QMI as officer commanding the machine gun section on 13 January 1900 although it is not clear how much time he spent with the section. On Sunday 1 January 1900 the guns saw their first action when they joined 1st QMI at the battle of Sunnyside. The Maxims were deployed with a section of Canadian Maxims and a section of 12 pounders to form the artillery fire support for the operation and placed on the right flank. 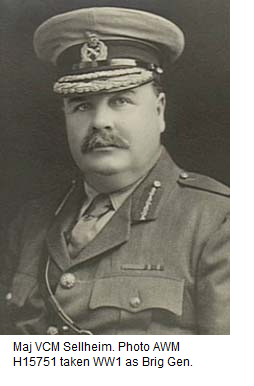 Their effectiveness was not officially reported upon, however trooper William A Morris of 'A' company QMI records in a letter finding Boer dead and wounded with multiple bullet wounds including one body with nine bullet wounds attributed to the Maxims. There was also a recorded incident of friendly fire as QMIs assault reached the objective although whether Canadian, Australian or both is not stated. On Monday 9 January 1900 the Queensland Maxims were again in action being part of the force that raided 30 kms into the Orange Free State from their base at Belmont. By February the section had arrived in Kimberley as part of the Kimberley Relief Force. Due to their weight and the condition of the horses the guns were found to be unsuitable for travel with their allotted column in the field and were reported as having been handed over to the Royal Artillery at Kimberley for safe keeping, being recovered for the return of the Contingent to Australia. This however is not quite the end of the story. On 31 March 1900 1st QMI were involved in the very nasty action at Sanna's Post. Trooper Herbert H Missing (1st QMI) writes, "We advanced in open order, lying down every few metres and pouring in a heavy fire. The enemy held their ground till we got the Maxim at work on them, soon after which they bolted ..."
The Australian Regiment was formed in Cape Town on 26 November 1899, a seeming contradiction of War Office intentions. It consisted of five infantry companies (drawn from all states except Queensland) and one mounted rifle company (Victoria). 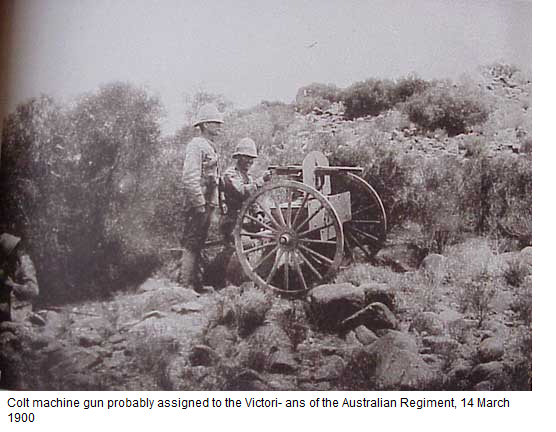 Western Australia sent two Maxim machine gun teams whilst the NSW infantry company had one. 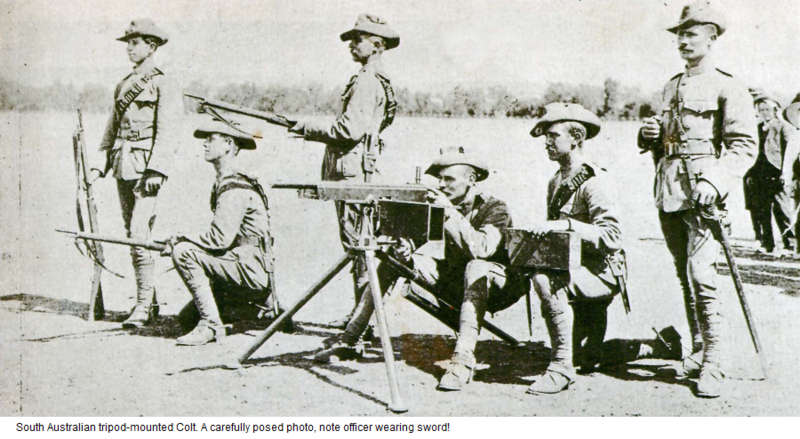 If the first NSW contingent was similar to the later NSW machine gun sections its machine gun would have been on a similar field carriage to that of Queensland (later the infantry company, and its machine gun would be 'E' company 1st NSW Mounted Rifles). The Western Australian guns appear to have been fitted with a light steel Dundonald galloping carriage. It is believed that the photo below is of the Western Australian guns in the Rensburg area in January 1900. Certainly the guns have been fitted to a light metal carriage with no encumbering ammunition boxes although the standard gun shield for this equipment has not been fitted. It is not clear if the NSW gun team ever adopted this form of carriage. Having joined the Regiment at Eslin, the three Maxims saw limited action as in general the Boers in that area avoided contact. One example of operations at this time took place on Tuesday 10 January 1900 a composite infantry company under the command of Major Cyril Cameron (Tasmania) moved out towards Graspan to ambush potential Boer routes. They took with them a Maxim gun. Held as a reaction force was the Victorian Mounted Infantry company commanded by Captain Robert Salmon, which had one of the Western Australian guns on a galloping carriage in case the Boers emerged from Jacobsdal in force. No Boer activity occurred and neither force saw action. February saw the unit holding over thirty kilometres of defensive line in the vicinity of Rensburg to prevent penetration by the Boers. The Maxims were used in a mobile role constantly moving to strengthen defences. The gun commanders at this time were Lieutenant Marcus William Logan (NSW) , Lieutenant John Campbell (Western Australia-the MG section commander) and Sergeant Major John Keating Paul (Victoria) commanding the second Western Australian gun. As such none of the guns took part in the action at Pink Hill (Hobkirk's farm). On 14 March 1900 the force was augmented by the arrival of a Colt 95 machine gun. After assembly, presumably on a galloping carriage, Colonel John Hoad appointed Sgt Major Paul (Victorian Permanent artillery) as its commander and after trials on the 14th the gun was declared ready and deployed for operations on the 15th. As the Victorian contingent had not brought machine guns it is possible that this arrival was to rectify this issue as it appears that the weapon was specifically ordered and sent from Colt's English subsidiary to the Australians. It was just in time as the operation to support the drive on Bloemfontein was underway. The Australians formed part of the force under General Clements on the march from Rensburg to Norval's Pont and on to Philippolis protecting the British flank south west of Bloemfontein. The machine gun teams were deployed in the column's flank guards as fire support. The fall of Bloemfontein saw the regiment and its machine guns close up with the main force. Here on 14 April the Colt 95 machine gun of the second South Australian contingent with its galloping carriage under the command of Sergeant Major Joseph Press arrived taking the number of guns in the unit to five, the most any Australian unit would have attached during the war. It had arrived just in time to see the Australian Regiment disbanded and broken up to form various subunits in the 1st Mounted Brigade under the command of General Hamilton. The South Australian gun was quite different in being a Colt rather than a Maxim. Lieutenant De Passey recorded that his group had been in 67 engagements during their tour. There were five other ranks in the South Australian machine gun team. The initial concept was for the Colt to be packed onto a mule to provide the mobility with the gun team on horseback. The section had practiced this method and felt confident that it would work. However this was not the mobility solution favoured by the Royal Artillery who controlled the guns in South Africa. Wheels were the order of the day but Colonel Joseph Gordon (Military Commandant of South Australia) realised the problems that this would create if the weapon was fixed to a standard carriage. He knew too that the Canadians had opted for the Dundonald carriage for their Colts. He had a carriage ordered from the London branch of the Colt Gun and Carriage Company for the cost of £213.19.00 ($427.90 converted - real value taday, some $1 M) including freight to be shipped to South Africa to meet the contingent at Cape Town. Much has been written over the years on the siege of Elands River. In this action some 505 Australians and Rhodesians (as well as approximately 50 native teamsters and labourers) found themselves surrounded by a Boer force estimated to be at least 3000. 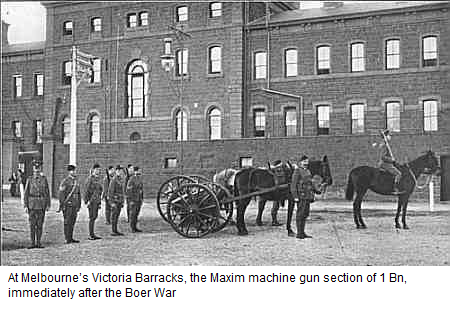 The Boers had modern artillery, several Pom Pom guns (a 37 mm one pounder automatic cannon based on the Maxim action), and their own Maxim machine guns. The Elands River force were critically short of support weapons having only one obsolete 7 pounder black powder, muzzle loaded field gun mounted on a 9 pounder carriage and two machine guns. The machine guns were one .450/577 black powder Maxim (belonging to the Rhodesians) and one more modern .303 Maxim that appears to have belonged to the NSW Citizen's Bushmen Regiment. The machine guns appear to have been the responsibility of Captain Edwin Hockings (Queensland Mounted Infantry) who soon found he had his hands full with problems. Both guns were very prone to stoppages and bore out a statement by a British general of the time that, like all new fangled technology they were fine in exercises on Salisbury Plain but in action had a bad habit of letting you down in the most embarrassing moments. It seemed his prophesy was coming true. Hockings however went to work and had the .45 stripped down and cleaned to within an inch of its life; to make sure that all the parts moved freely and smoothly. It then gave perfect service for the rest of the siege. The .303 was a different proposition, the same treatment improved the performance but stoppages were still regular. In a light-bulb moment he went to his OC, Major Tunbridge from Queensland, who at that moment was relieving Colonel Hore as the post commander due to the latter's illness, and requested permission to use the riflemen's ammunition in the guns. Permission granted, the .303 then worked perfectly for the rest of the siege. Clearly purpose-made British machine gun ammunition was causing a problem. The siege of the Elands River Post was balanced on a knife edge for a long period of time; a disinclination by the Boers to mount a frontal attack on machine guns may have swung the odds in the Australians favour. There appeared to be three key problems with the Maxims in particular. They were the weight of the equipment on conventional carriages, lack of understanding of how to deploy the weapon and a serious problem with stoppages. One British commander, the Earl of Dundonald, became so concerned at the mobility issue posed by conventional carriages that he developed a light-weight steel carriage known as the Dundonald galloping carriage which significantly reduced weight and enhanced mobility. The second problem was the guns employment. Machine guns were still administered by the Royal Artillery and were treated as light field pieces. As such they were very much second rate field guns; their large carriages making such obvious targets. Some British units were known to dismount their guns leaving the carriages as decoy targets. These problems of mobility and employment led to guns only being used in set-piece battles, some units even leaving their weapons in store. One solution appeared the ready adoption of the Colt 95 (often referred to as Colt's gun) a much lighter air cooled weapon and with a reputation for reliability.